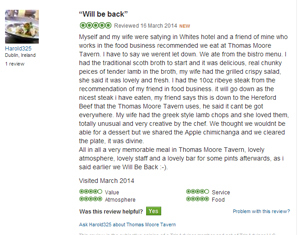 Myself and my wife were staying in Whites hotel and a friend of mine who works in the food business recommended we eat at Thomas Moore Tavern. I have to say we weren’t let down. We ate from the bistro menu. I had the traditional scoth broth to start and it was delicious, real chunky pieces of tender lamb in the broth, my wife had the grilled crispy salad, she said it was lovely and fresh. I had the 10oz ribeye steak from the recommendation of my friend in food business. it will go down as the nicest steak i have eaten, my friend says this is down to the Hereford Beef that the Thomas Moore Tavern uses, he said it cant be got everywhere. My wife had the Greek style lamb chops and she loved them, totally unusual and very creative by the chef. We thought we wouldn’t be able for a dessert but we shared the Apple chimichanga and we cleared the plate, it was divine.